My Father in Law worked for Edison and I still have a deck of Reddy playing cards ; they had a geat neon sign of Reddy downtown which really looked the part ! Very nice, Dan. RK really does look anorexic. Needed some Big Macs and steroids. Reddy Kilowatt would need some beefing up for today's needs. Introducing, Reddy Gigawatt. Another branded item assumed (by me, anyway) to be "local" in name were/are the breads baked by big, local commercial bakeries...when in fact they were nationally franchised. The brands "Sunbeam", "Sunny Boy" and "Holsum" come most immediately to mind. In Wilmington DE, the Huber firm baked Sunbeam, and the Freihofer firm baked Sunny Boy. In the Newburgh NY area, it was the Williams firm who baked the Holsum brand. And I thought Reddy Kilowatt was an invention of the local electric untility. I suppose there are a lot of things that were presented as local when they were actually used nationwide. I remember having one of those when I was about 5-6 years old. I'm 65 now and wish I still had it. I THINK that the Reddy character was first introduced by General Electric to promote the use of electric power just after World War 2, but was given over later by GE to the Edison Electric Institute (EEI) for the same promotional purposes. EEI also operated and promoted "The All-Electric Home", the "Better Light, Better Sight Bureau", "The Industrial Electrification Council" and the "National Industrial Electric Heating Conference" to promote the product of its member companies into various vertical markets. 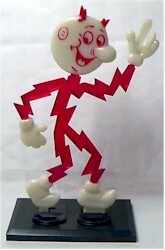 I have a great Reddy Kilowatt Halloween costume, with a true light up nose and blinking LEDs on the lightening stripes. I can roast your roast,Ican toast your toast, i can heat your coffee pot,I am always there with plenty of power to spare cause i "Ready Kilowatt"